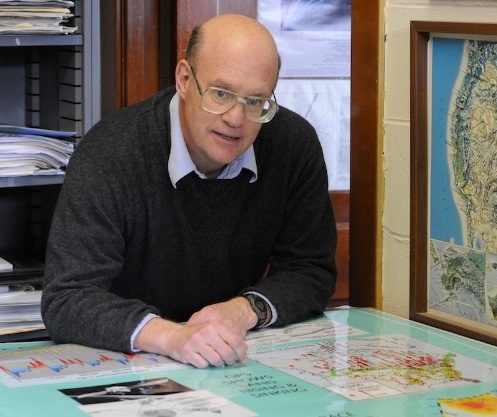 Seth Stein is Deering Professor of Geological Sciences at Northwestern. He graduated from MIT in 1975 (B.S) and Caltech (Ph.D) in 1978. His research interests are in plate tectonics, earthquake seismology, earthquake hazards, and space geodesy. He has been awarded the James B. Macelwane Medal of the American Geophysical Union, the George Woollard Award of the Geological Society of America, the Stephan Mueller Medal of the European Geosciences Union, the Price Medal of the Royal Astronomical Society, and a Humboldt Foundation Research Award. He has been elected a foreign member of the Academy of Europe, a Fellow of the American Geophysical Union and Geological Society of America, and named to the Institute for Scientific Information Highly Cited Researchers list. He was one of the organizers of EarthScope, a national initiative to dramatically advance our knowledge of the structure and evolution of North America, served as Scientific Director of the UNAVCO consortium of universities using GPS for earth science, and been Visiting Senior Scientist at NASA’s Goddard Space Flight Center.